Here a sample of what could be made with this precious flocked window 12 x 12 paper that comes with the Candlelight Christmas Specialty Paper. Is one of my BFF birthday today and this is the card I sent her. She loves red so I really hope she likes it. She deserves it!! 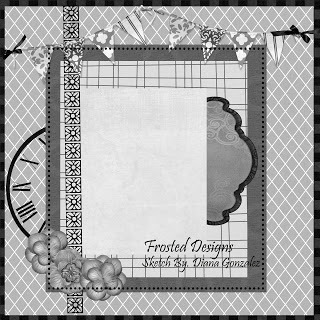 The sketch from the Fabulous Friday Challenge at Frosted Designs inspired me to make this. What do you think? See other cool samples with this sketch HERE! Aqui un ejemplo de que se podria hacer con este papel especial que viene con el Papel Aterciopelado de Disenador Candlelight Christmas. Hoy es el cumpleanos de una de mis mejores amigas y esta fue la tarjetita que le envie. Yo espero que le guste mucho, ella se merece eso y mucho mas! Fabolosos por Frosted Designs.......una gran inspiracion! Pueden ver mas ejemplos hechos con este esquema AQUI! Stamp sets: Hello friend (retired), Got Treats (cupcake and got birthday sentiment), Cardstock: Crumb Cake, Basic Black Craft Ink, Candlelight Christmas Specialty dsp. Tools: Heat gun, Clear Embossing Powder, Petite Pennants Punch, Glimmer Brad, black grosgrain Ribbon. In another note....pray for our country today...we are having our Presidential Elections. Praying His Kingdom come, His will be done on earth as it is in heaven". Many blessings to all..more samples to come! Leave me your love with your comments! Very creative use of the sketch!! Love that you used it for such a cute card! Thanks for playing along with us @ Frosted Designs!! Very classy card! Love that flocked paper banner! Thanks for joining us at Frosted Designs. Very nice card...love how you used our sketch for it!! Thanks for sharing with us at Frosted Designs! !